PLEASE NOTE: The YEStation Mini Family (22XX) of Thin Client Terminals are no longer manufactured. The current equivalent replacement is the Computer Lab International (CLI) AG6601 Thin Client Terminal. Click here for other CLI models available for use as "Ethernet Terminals". New 122-key keyboards are available for your current Affirmative Thin Client Terminals. The new YEStation Mini family of thin clients just raised the bar for performance, while lowering the desktop space requirement. Built around an Intel�-compatible SIS 550 processor that can run either Windows� CE.NET, Linux or XPe operating systems, the new hardware platform is 35% smaller, 20% faster, uses 30% less power and is 29% less expensive than other thin clients. YEStation Mini has a very small footprint - only 7.75" by 6" by 1.5" - and can be mounted vertically on a wall or attached to a monitor. The unit weighs only 1.5 pounds allowing for optimal mounting options, and low shipping costs. The YEStation Mini model 2205 provides ICA and RDP clients for connections to Windows Terminal Services and Citrix servers as well as an embedded Internet Explorer 5.5 browser (previously an extra cost option) for access to Web-enabled applications, including email. Priced at $395, it is the lowest-priced Internet Terminal for IBM iSeries and OS/400 users running Client Access, Rumba or other server based emulators. Terminal style 122-key, 5250/PC keyboards are supported by installing Affirmative�s keyboard drivers and map files. All YEStation Windows Based Terminals (WBT) include CE.NET, which has several new features not available with CE 3.0, including a secure VPN client and support for USB disk drives. Other free features include Acrobat Reader and Microsoft� Office Viewer clients for display and print of PDF, Word, Excel, Access and PowerPoint files received as email attachments or from Internet/Intranet sessions. The YEStation Mini�s advanced technology provides the best price/performance in the industry. Backed by Affirmative�s superior technical support and six years of thin client experience with AS/400 and iSeries users, the YEStation Mini is an ideal enterprise-wide solution. 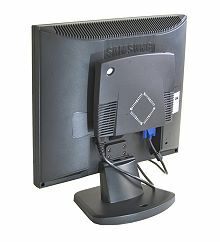 Mounting options include vertical or horizontal orientations and LCD monitor integration with VESA Mounting Option..